Cash prices vary, and they can be different than insurance prices for Pain Pumps. One of the hospitals in Modesto, Stanislaus Surgical Hospital has recently quoted us $160.00 for the On-Q PainBuster Post-Op Pain Relief System. This price was just updated and verified for June 2013. Please check with us for more specific prices. They will probably tend to go up with inflation, but this price will serve as a rough guideline. For our plastic surgical practice in Modesto, CA, this is a pass through directly to the patient without any mark up from us. We are happy to implant this pain pump for you after the surgery and you will discuss this in detail at your Tummy Tuck consultation with Dr. Tammy Wu if you were to become a patient of ours. What are these pain pumps? They are small external pumps filled with pain medicine such as marcaine or lidocaine with a tubing that goes through the skin and into the painful incisions and muscle tightening areas of the tummy tuck surgery. The exit site of this pump is very similar to the drains which my be placed with Tummy Tuck surgery. These pain pumps are made by various companies. 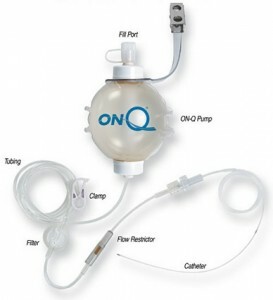 On-Q PainBuster is one of the brands of pain pumps which we use. These pain pumps are also used after other surgeries. They are not specific to tummy tuck surgery. Size of the pain pump? The size of the pain pump is about the size of a single fist. Most of the time there is a pouch with a zipper that hides it all and it is battery operated. When is the pain pump removed after Tummy Tuck Surgery? It is usually empty after about 4 days. This gives you added support to your pain management for about 4 days after your tummy tuck procedure. This entry was posted in Cost of Tummy Tuck, Dr. Tammy Wu, Hospitals, incision, Modesto, Tummy Tuck and tagged on-q, pain pump on June 23, 2013 by Calvin Lee, MD.